With it’s great construction quality, ease of use and portability, the Sevylor Tahiti Plus is a class-leading inflatable kayak. For years, Sevylor has churned out quality canoes and kayaks that have delighted outdoor adventurers across the United Kingdom and the world. The Tahiti series of kayaks has been particularly successful, which is why Sevylor decided to add to its collection with the Tahiti Plus inflatable kayak. 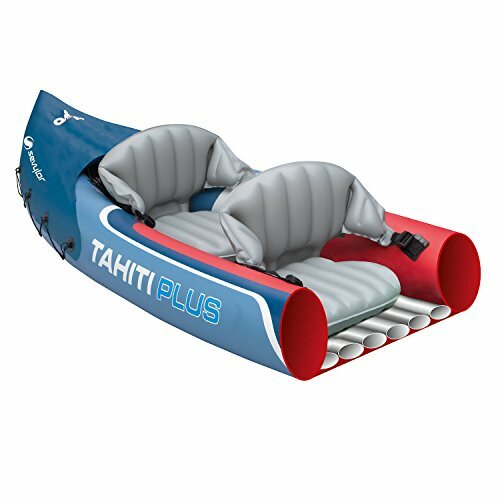 Unlike many inflatable kayaks, the Tahiti Plus is more than a toy. Made from 26 gauge PVC material, the Tahiti Plus is capable of seating two full sized adults without any difficulty. It also contains a convertible seat in the rear that can be used by a child wishing to accompany the adults. All things told, the kayak can support up to 200kg of total weight, making it by far the king of the inflatable class. The Tahiti Plus offers a comfortable and stable ride and is pretty easy to steer too, even for novice kayakers. That said, in windier conditions things can get a little trickier due to it’s lightness; the addition of a skeg makes a noticeable difference to the amount of control you have in steering it in such conditions. And having a high quality paddle will also help with control when the wind gets up. Although this extra weight allowance means that the kayak is a bit heavier than its competitors, its 13kg total weight and 385 x 90cm length and width should not be a problem for families or individuals to transport. The Sevylor Tahiti Plus easily fits into the trunk of a car, and the company’s new backpack technology allows users to wear the deflated kayak as a shoulder bag for simplified transport capacity. Users can simply roll the kayak up and clip it into a comfortable back support – no more hauling the kayak through the woods back to the car! Sevylor customers no longer have to worry about their kayak springing a leak, thanks to the built-in emergency repair kit installed in every Tahiti Plus boat. The emergency repair kit contains essential items for quick boat repair, including helpful tools and patching materials. Learning how to repair your boat can turn a soaking wet disappointment of a day into a mere hiccup along the path downstream. Everyone who has ever piloted a kayak knows how frustrating it can be to pull a kayak cleanly out of the water. The Sevylor Tahiti product simplifies this annoying process with built-in carry handles on both sides. Dragging the kayak from the river can now be a one man job! The Tahiti Plus’s state of the art Boston valves allow for quick deflation so that you can avoid the wrath of Mother Nature when you see a storm coming. And what’s more, kayak owners no longer have to stomp stubborn air out of their inflatable product – the air is vacuumed out through innovative draining techniques. Although this Sevylor kayak unfortunately does not come equipped with a paddle, Sevylor sells a variety of single and double paddled manoeuvring devices for kayak owners of all shapes and sizes. Sevylor also sells safety equipment like helmets, life jackets and advanced emergency kits. Everyone who owns a Sevylor kayak knows the incredible quality of the company’s products, and the accessories included in the kayak category are certainly no different. The Sevylor Tahiti Plus boasts class-leading leg room, advanced deflation and storage technology, a sturdy PVC-lined exterior and comfortable inflated seats for two adults and a child. The Sevylor team’s commitment to passenger safety and attention to detail separate this inflatable kayak from other similar products manufactured by the competition. If you’re planning a long trip downriver with your mates or just looking for a boat to entertain the family at the lake, look no further than the Sevylor Tahiti Plus inflatable kayak.